The canal to be built across Nicaragua threatens the largest source of freshwater in Central America, environmentalists warn. MANAGUA, Aug 23 2013 (IPS) - The law passed in Nicaragua to grant a concession to a Chinese company to build a canal between the Pacific and Atlantic oceans repealed legislation that protects Lake Cocibolca and its tributaries. Lake Cocibolca, also known as Lake Nicaragua, is the biggest source of freshwater in Central America and the second largest lake in Latin America after Venezuela’s Lake Maracaibo. The alarm over the new threats to the lake was sounded by two local NGOs, the Nicaraguan Alliance on Climate Change (ANACC) and the National Risk Management Body (MNGR), in representation of 20 environmental groups in the country. Law 840, dubbed “the great inter-oceanic canal law” by the press, was approved by the legislature in June, with the votes of the governing left-wing Sandinista National Liberation Front (FSLN) of President Daniel Ortega. The canal, which will go across the lake, will be nearly four times longer than its rival, the Panama Canal. The concession to build and run the canal for 50 years, extendable by another 50 years, was won by the Hong Kong-based Chinese company HK Nicaragua Canal Development Investment Co. Ltd. (HKND Group), owned by Chinese tycoon Wang Jing. The cost of building the canal is an estimated 40 billion dollars. According to the MNGR, the new legislation repealed the laws that defend the country’s natural resources and bodies of water, included in the “legal compendium on potable water and sanitation”. The compendium, compiled in 2011 by the national commission on potable water and sanitation and sewage, includes 85 laws, decrees, municipal ordinances, constitutional provisions, international treaties and administrative regulations that protect the country’s bodies of water. The state also gives up the right to sue the investors in national or international courts for any damage caused to the environment during the studies for and the construction and operation of the canal. Nicaragua granted HKND control over the lake and its surrounding areas, including 16 watersheds and 15 protected areas, where 25 percent of the country’s rainforest is concentrated, David Quintana of the Nicaraguan Foundation for Sustainable Development told Tierramérica*. The proposed canal routes run through nature reserves that are home to hundreds of species of plants, birds, mammals, reptiles, amphibians, fish, molluscs and crustaceans. 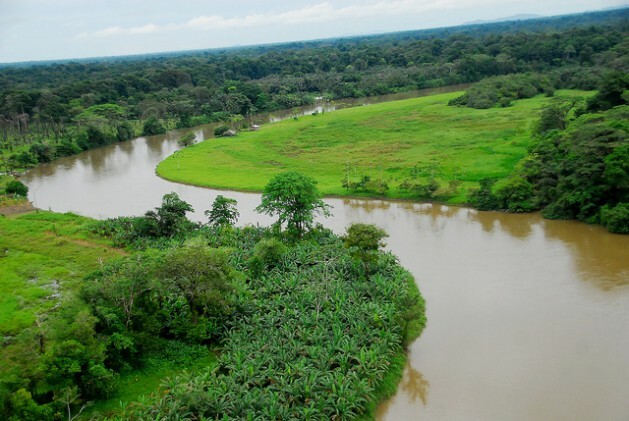 The assistant director of the Humboldt Centre, Víctor Campos, said the canal would simply destroy any chance of making Lake Cocibolca the source of water for all of Central America at some point in the future. “Construction of the canal and conservation of water for human consumption are mutually exclusive – you either have a canal or you have a reservoir of water for the population,” Campos told Tierramérica. The canal will be built across 190 km of land, while an additional 80 km of the route will go through Lake Cocibolca. It will serve larger ships than the Panama Canal. Biologist Salvador Montenegro, director of the Research Centre for Aquatic Resources of the National Autonomous University of Nicaragua, told Tierramérica that the work on the lake will generate enormous amounts of sediment that will muddy the water and suffocate most of the fish and other forms of life. Montenegro said the size of the canal – 520 metres wide and 27.6 metres deep – poses the worst environmental scenario for the lake and surrounding watersheds. “A small oil leak, an earthquake, or the strong winds that blow in that area could cause an ecological catastrophe that would forever put an end to potential human consumption from the lake,” the activist said. The same concern was voiced by Jaime Incer Barquero, a scientist who advises President Ortega on environmental issues. “We are still in time to rectify this and not make the extremely serious mistake of endangering the biggest source of water in the country and Central America; no canal is worth as much as that lake,” Barquero told Tierramérica. In the face of the barrage of criticism, the president has stated that the environmental impact study will be decisive in determining the future of the canal project and the route it will take. But the environmental and technical authorities did not respond to the arguments of the possible environmental risks, and have merely stressed the economic benefits that the canal will bring to Nicaragua. HKND spokesman Ronald MacLean has stated in several communiqués that the British consultancy Environmental Resources Management would carry out a professional environmental impact assessment of the different routes considered for the canal. “Obviously, we also have to address the environmental question, because we will have to see what impact the project will have and what will be the cost of a remediation programme so that the final outcome is positive,” he said in an early August email sent out by the company’s public relations firm in Managua. Meanwhile, environmental organisations, business groups and opposition sectors, as well as indigenous communities worried about threats to their land and their access to water, are preparing to bring legal action against the project.